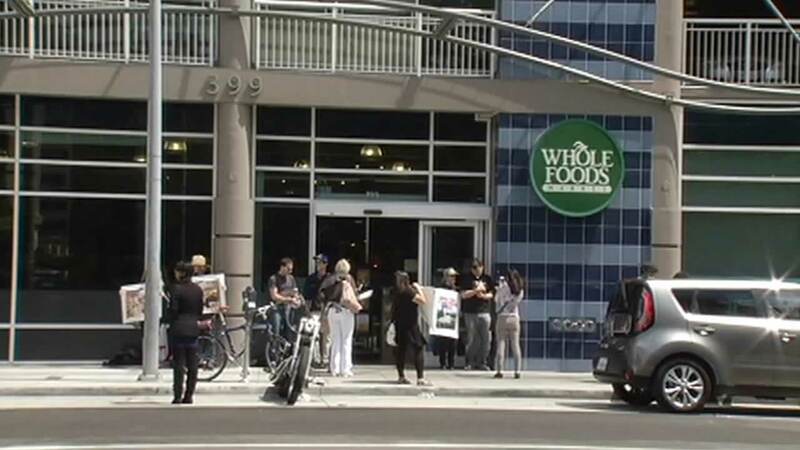 Protesters staged outside 14 Bay Area Whole Foods Markets on Sunday in an effort to save the bunnies. SAN FRANCISCO (KGO) -- Protesters staged outside 14 Bay Area Whole Foods Markets on Sunday in an effort to save the bunnies. Whole Foods will be selling rabbit meat at certain locations, many in Northern California. The store said more Americans are eating rabbit as a more sustainable, leaner protein option. Those advocating against eating rabbit said eating a companion animal is wrong. Some are surprised because Whole Foods has a reputation for selling products that are not tested on animals, including rabbits. "Over two million have rabbits as household pets and Whole Foods is trying to create a market for rabbit meat. And I think that that's wrong and completely unnecessary. We don't need yet another animal flesh option at Whole Foods," Save A Bunny volunteer Lisa Zorn said. House Rabbit Society organized Sunday's nationwide protests at 40 different Whole Foods stores across the country. It plans to do so until Whole Foods reverses its decision to sell rabbit meat.